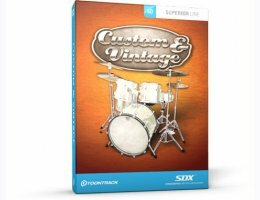 The Custom and Vintage SDX features extensive stick and brush recordings of a unique collection of drums and cymbals, designed to give everyone from top producers down access to the cream of custom and vintage drums, built by craftsmen from the 1920s right up to the exceptional instrument makers of today. Most of the highly prized instruments that come with this library, like the 1920s Ludwig Black Beauty or the Craviotto Timeless Timber, are extremely hard to come by and can only be found in the collections of top studios or hired from rental facilities in the major music centers of the world. The Custom and Vintage SDX was recorded through a classic EMI TG mixing console at the noted 2 Khz Studio in London, England. This unique piece of equipment is considered one of the best sounding ever made and has been used in numerous legendary recordings of the early seventies, like The Beatles’ "Abbey Road" and Pink Floyd’s "Dark Side of the Moon". All recordings were overseen by Grammy Award-winning engineer Peter Henderson, who started his career training exclusively with legend Geoff Emerick (The Beatles), worked alongside producer Sir George Martin for numerous sessions and went on to record multiple million-selling albums. The drums were sampled by Chris Whitten, widely known for his live or studio work with major artists like Dire Straits, Paul MacCartney, Johnny Cash, Julian Cope, World Party and The Pretenders.